It’s Thanksgiving, a day when we are encouraged to reflect on things we’re grateful for. One thing that comes to mind is animal sanctuaries. Just beyond Asheville, NC is a very special place. And you need some good boots to get around there, because it’s on the side of a mountain. That suits the residents just fine, however. Most of them enjoy climbing. They’re goats, after all. Which is why the name of this sanctuary is Goat Mountain Ranch. Rob is the fellow who runs the Ranch. He took over the property from his mother many years ago – he moved to the country from the northeast, she moved from the country back into the city. Go figure! Goat Mountain Ranch Sanctuary sort of happened gradually, though. Rob, a vegan and animal lover, saw a need for critters besides dogs and cats to be rescued. His unique property was just right for goats, sheep, potbelly pigs, small donkeys, chickens, turkeys and peacocks. Any medium sized animal that wouldn’t mind the terrain. We had a wonderful visit with Rob and we got to meet some VERY cute new goat friends. The Dirty Hippy had a particular fondness for Chewy, a large Nubian goat. That’s him on the top left in the pics below. Does he remind you of Chewbacca? 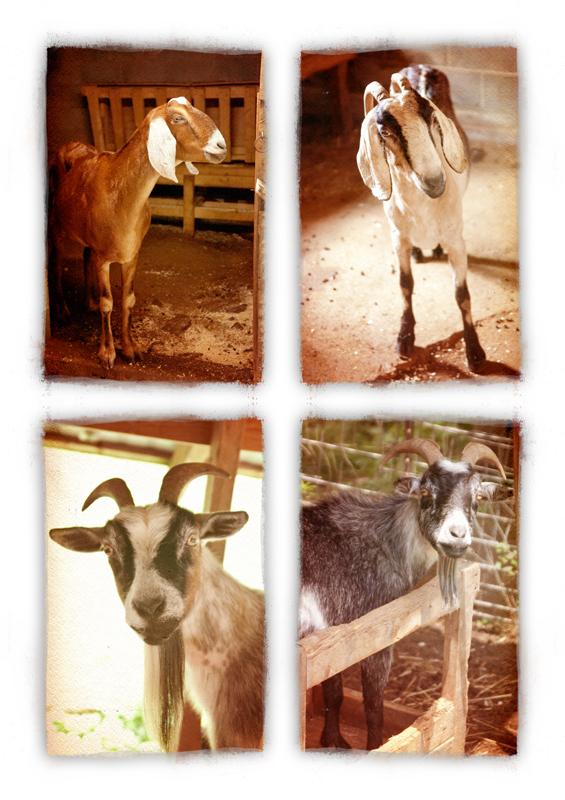 The other three in the pics are residents, too – that’s Noel on the left and bottom right, Katrina. Isn’t the little pygmy in the feeder adorbs? That’s Wilson! Goat Mountain was so peaceful and scenic. The Asheville area is well known for its gorgeous mountains and breathtaking vistas. 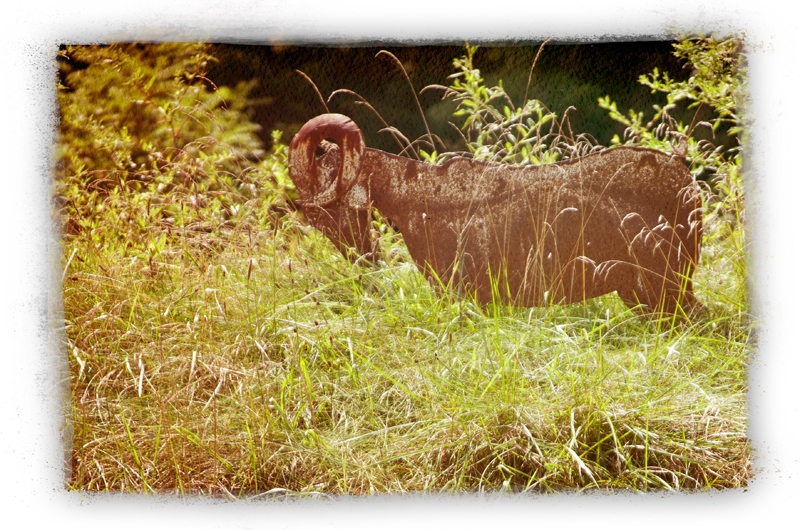 As you can see – the views at the Sanctuary were made even more spectacular by the animal residents. Mint grows wild all over the 25 acre property, too – and is regularly munched on by the goats. Can you imagine it? Goats with minty fresh breath! And – all the fresh blueberries – which grew wild there and were completely delicious – they were amazing, too! Below is Cassidy. 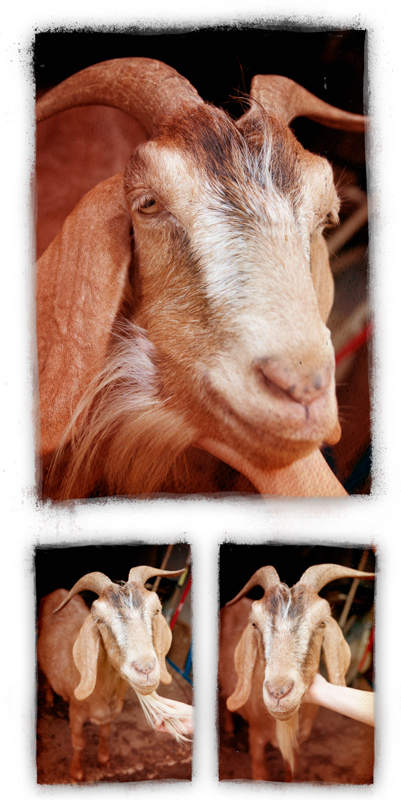 He’s another Nubian goat and a handsome fellow. That’s Rob hanging out with him, and the goat on the bottom left is a sweet gal named Babee – she was kind of shy. Butch (yes, like the counterpart name for Cassidy – and his actual brother!) was perhaps the friendliest goat on the mountain the day we visited. He liked having his beard scruffled and scratched! Seriously, does it get any better than scratching the beard of a Nubian goat?? The Bohemian Girl really enjoyed meeting Butch. 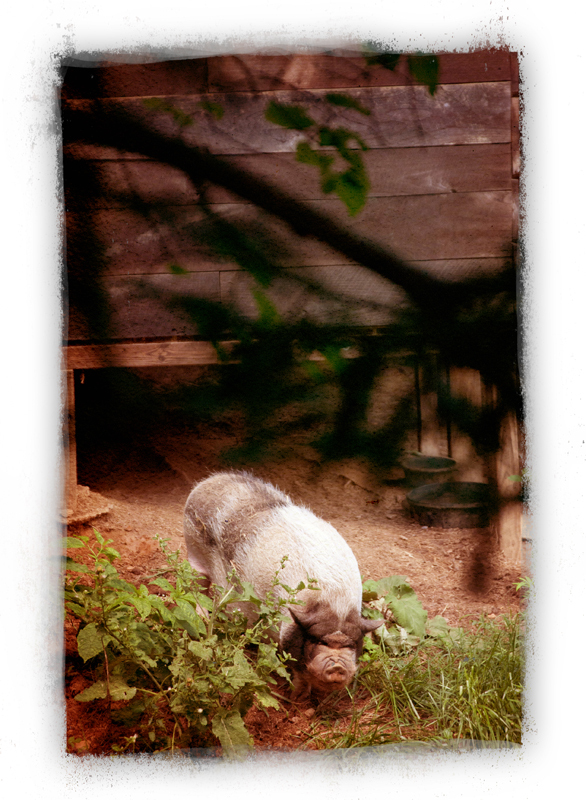 Ozzy was one of the potbelly pigs at the Goat Mountain Ranch. His story was a tear-jerker; Ozzy was found in a private home, severely neglected. He was locked in a dark room and had so little space to move, that he was trapped in his own feces and a carpet had grown into his body. Rob has committed a lot of TLC (and funds for veterinary care!) to rehabbing Ozzy. And it was worth it – look at Ozzy now! He can walk and enjoy fresh air and root in the dirt. When you see this little fellow out, embracing life again, it’s almost enough to make you want to cry. Rob also has a number of rescued sheep on the mountain. It was the first time either of us had met a true black sheep in person! Her name was Darla and she was quite friendly; she even came and ate some grains from our hands. Her friend, Bella, was a little shyer and sort of hung back. Bella was beautiful, though! 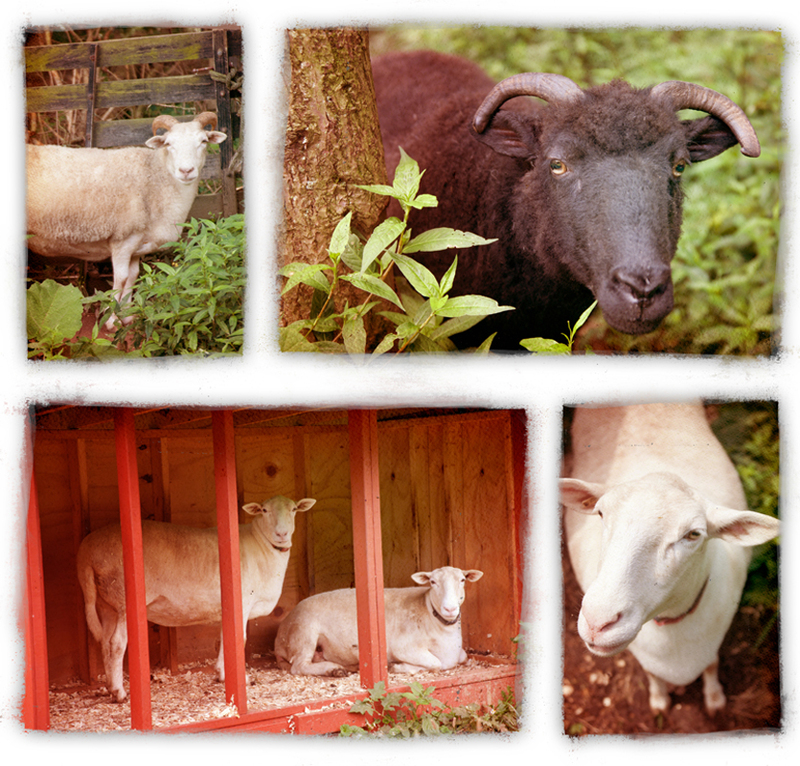 A few of the other sheep had recently been sheared – they weren’t as outgoing as Darla either, but super pretty gals – Lucy and Ethel, pictured on the bottom images! If goats are the headliners at Goat Mountain Ranch Sanctuary, then Shrek the donkey is sort of like the emcee. He was with us the entire time during the tour and wow – can he navigate the mountain side like a champ. We didn’t get a photo, but at one point, he had his face in our camera bag looking for snacks! Shrek was one smart donkey, and handsome too! Rob has lots of other wonderful residents on the mountain. Turkeys, peacocks, more potbellies. If you are local to the area of Asheville, you can apply to adopt animal companions from Goat Mountain Ranch. Rob is (rightfully) strict about who can adopt from the Sanctuary – you need to complete lots of paper work, have the right kind of property, experience with pigs/goats/etc., and generally pass muster. Oh – and these cuties below – the potbellies are Rosey and Buddy; the turkey is Henley. If you can make it to the Asheville area to visit (they are just a few miles from Asheville in Leicester) , tours are great fun! Set it up in advance online with Rob or one of his volunteers. There is no paid staff at Goat Mountain, the entire place is operated by Rob and his volunteers. Can’t get to Asheville? You can still help. You can “virtually adopt” an animal, or buy one of Rob’s vegan cookbooks or a teeshirt/mug from the Sanctuary! Donations are also perfect for the ranch – the needs and costs of feeding, vetting and homing all the critters on the mountain is considerable. Any amount helps and donations are tax-deductible. 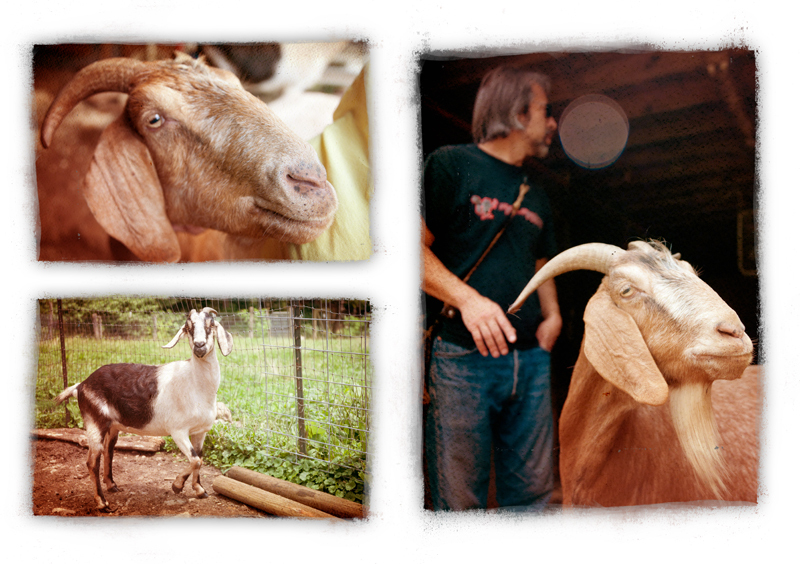 On this special holiday, we are thankful for Rob and Goat Mountain Ranch Sanctuary. It was a wonderful time to meet Butch, Cassidy, Darla, Chewy, Shrek, Ozzy and the rest of the crew. Thanks, Rob for showing us around your mountainside and introducing us to your furry family! November means the end of garden season in this area, which means we ended up with several baskets of green tomatoes. And let’s be real, you can only eat so many fried green tomatoes before you get bored. So we made curry. The tart green tomatoes are a nice counterpoint against the spicy curry and sweet mangoes. This dinner comes together in a few minutes, and is great served over grains (we made a brown rice/quinoa blend) or you could add it to a wrap. It’s also a super fast and flavorful dinner if you have guests over the long weekend. In a large skillet, melt coconut oil over medium-high heat for about one minute to coat pan. Add onions and garlic. Saute two to four minutes, to wilt. Add green tomatoes, curry powder, turmeric, cinnamon, red pepper flakes and salt/pepper if using. Cook, stirring often, about 5 to 7 minutes until everything is lightly browned and coated in tomato juice and spices. The tomatoes sort of make their own sauce. 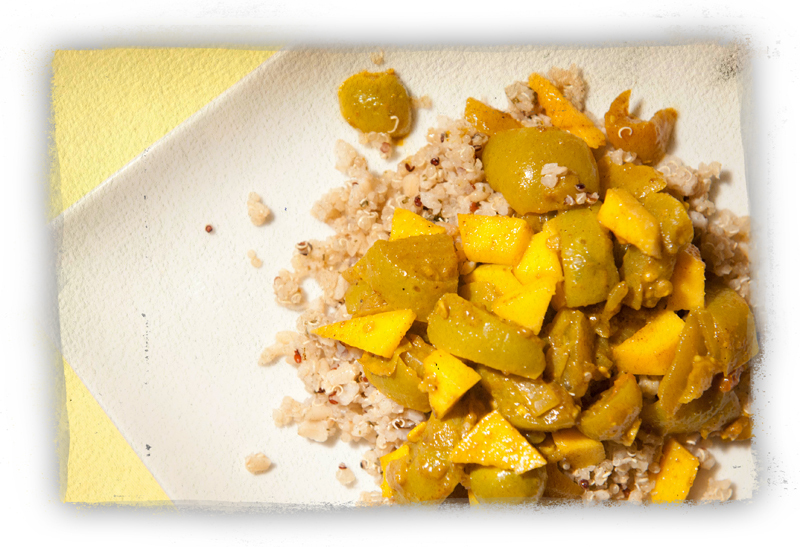 Stir in cubed mangoes and serve warm over grains or in a wrap with greens. Cooks Note: This recipe is easy to adapt – you can add chickpeas or cooked lentils, spinach or cubed/cooked potatoes to make the meal go further. Want it hotter? Add more curry and/or red pepper flakes. On the radio in Annapolis, MD! Recently, the Bohemian Girl (aka as Rissa) was honored to be interviewed on Annapolis Green Radio for their show on “Eating Thoughtfully” – basically it was a show about how diet affects the planet. You can still listen to the show online, even if you can’t tune into Annapolis 99.5FM – it’s preserved on the internet forever! Rissa shared the interview with Lori, director of Sister Eden, where so many of our fun vegan recipes and eco-crafts find their home online. Thanks to Eliva and Vic, hosts of the Living Green show on WNAV for having Lori and myself in to talk about diet and the environment – it was super fun (though I was nervous), and hope your listeners enjoy the program! My Dad has this sort-of rule that stuffing *has* to have meat in it to be delicious. After careful consideration, we cooked up this recipe, featuring Beyond Meat Chicken-Free strips, dried apricots, capers, pecans and oregano. The Beyond Meat gives the stuffing that meaty bite and aroma my Dad loves; the capers and apricots bring depth and sophistication; the pecans add crunch; the oregano is like a whiff of the garden. Basically, it comes together smoothly to make a delicious Thanksgiving or Christmas side! We bought already-dried bread cubs from our local bakery. You can find cubes like this at bakeries or grocers – or make your own by cutting a loaf of your favorite bread into cubes and allowing them to dry out on the counter for a day or two. Really stale, crispy bread cubes are the way to go for stuffing. If they’re too soft, they get mushy in the stuffing. Preheat oven to 350. Spray a 9×13 casserole with non-stick spray or rub with a few drops of olive oil. Set aside. In a large skillet or cook pot, add olive oil and onions over medium-high heat. Saute 2 or 3 minutes, to soften onion. Add celery, carrots, capers and garlic. Saute another 4 to 7 minutes, until all veggies are lightly browned then add shredded Beyond Meat, dried oregano, dried thyme, white pepper and salt (if using). Cook about 2 to 3 more minutes and set aside, off heat. Combine chopped dried apricots, 1/2 cup chopped pecans and bread cubs in a large mixing bowl. Toss in Beyond Meat-veggie mixture and fold together. Pour in egg replacer and broth, as well as a splash of dry white wine, if using. Quickly stir to moisten, then turn out into prepared 9×13 casserole dish. Sprinkle remaining 1/2 cup pecans onto stuffing and cover with aluminum foil. Bake covered for 30 minutes. Uncover and bake an additional 15 minutes, to crisp the top. Garnish with fresh parsley, if desired, before serving. One of the most common questions we are asked is for EASY vegan baking ideas. Well, we’ve got TWO for you. Both are simple and use familiar ingredients. They’re also super for kids to help with and as the days grow cooler, what is more comforting than the wonderful aroma of home-baked treats from your own oven? First, try Chai Spice Rolls. Chai Spice Rolls are a snap to put together. They’re also tasty enough to serve to company or at Sunday Brunch. There is a delightful surprise on the inside when you bite into a creamy filling, flavored with exotic chai tea, ginger and maple syrup. This is also a great recipe to have kids help with, or to serve to guests who are spending a long holiday weekend at your house! 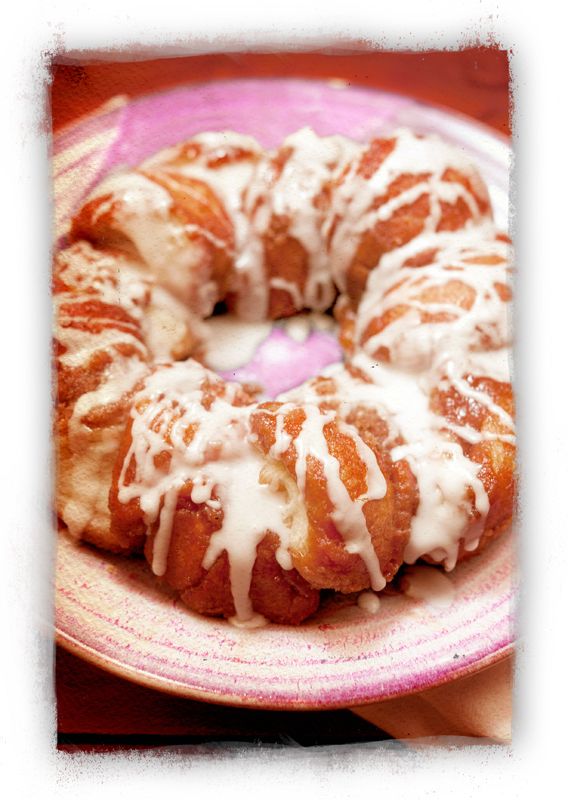 Click on over to Sister Eden for the recipe now. Want more easy vegan baking? 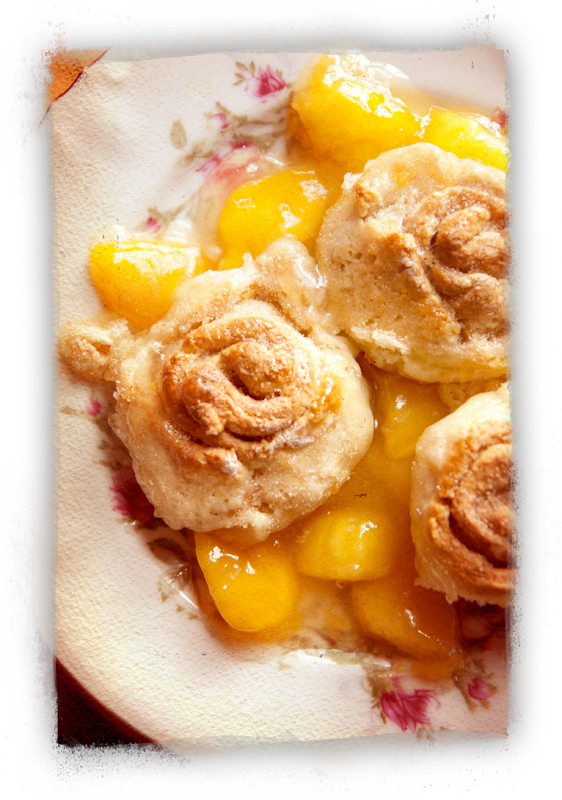 Try Peach Whirligigs! This original recipe comes from our pal Kristin at The High Impact Vegan, who veganized a family recipe. And with good reason. It’s freaking delicious! This time the easy baking secret is Bisquick. Yes, that’s right, old school Bisquick is vegan, too! There are even three kinds of Bisquick – original, heart-smart and gluten-free. So take your pick! Peach Whirligigs are usually made with fresh peaches, however, in the winter when they’re not in season, we have found that canned peaches work just fine. The flavor is simple and bright, and really, this is like sunshine on a plate. This is another recipe we have cross-posted to Sister Eden, so please hop over there to check it out. And while you’re surfing the internet, be sure to visit Kristin’s vegan blog, too. You’re going to enjoy this – serve it for breakfast, brunch or dessert! These are excellent with vegan ice cream! Pile on the vanilla So Delicious! Yum! In 2013, we won Beyond Meat‘s Clucktober contest, and they gave us – for a Twitter post – a free year of product. It was pretty freaking awesome. We have been posting away all year, making fun new recipes with the chicken-less strips and beef-less crumbles. We’ve also made a few friends with the folks that work there, like Justin. He said he thought that Beyond Meat might not make it as a main dish for the holidays, but we wanted to show him that it could easily take center stage. Like in these incredibly elegant, yet easy Savory Holiday Pastries. They literally take less than 30 minutes to make. Try that timeline for any other holiday main dish! 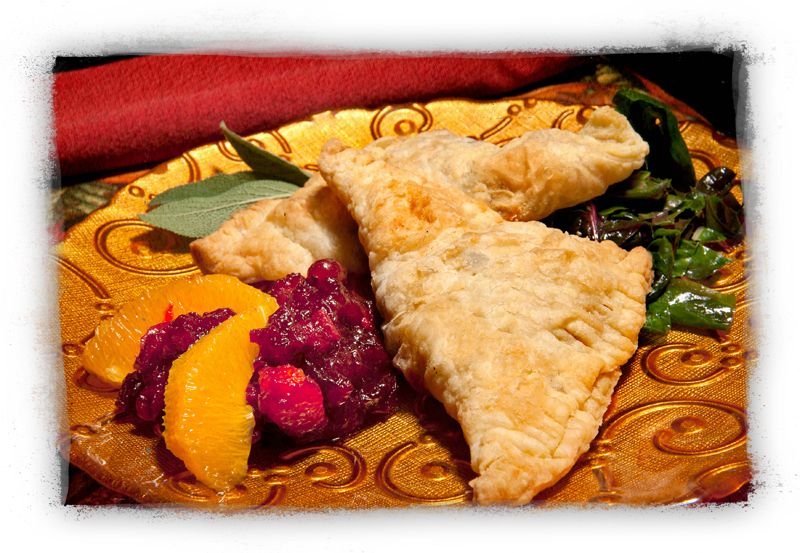 To serve alongside, we devised a Spicy Cranberry sauce that accents the pastries – the secret ingredient is adobo sauce! This recipe is a snap, too. Need a simple side? Try any kind of steamed, wilted greens – Swiss chard, kale, arugula, spinach. Greens are amazing with cracked pepper and a splash of vinegar. In a medium saucepan, combine cranberries, marmalade, chipotle pepper and adobo sauce. Stirring frequently, cook over medium-high heat until cranberries begin to pop and crackle. When a thick gel has formed (cranberries have loads of natural pectin! ), remove from heat and set aside until ready to serve the meal. Preheat oven to 400. In a small bowl, stir together fig jam and vegan cream cheese. Set aside. Using a fork or your fingers, shred Beyond Meat chicken strips into small pieces. Set aside. In a large skillet, combine chopped olive oil, onion, mushrooms, thyme, sage, white pepper and salt over medium heat. Saute 4 to 6 minutes, until onions are translucent and mushrooms tender. Add shredded Beyond Meat and stir to until coated and warmed through. Remove from heat. On a flat work surface, unroll both sheets of puff pastry from the box. Cut each sheet into six equal pieces. Add a spoonful of fig jam/cream cheese to one corner of each of the twelve puff pasty pieces. Top with even amounts of Beyond Meat/onion mixture until all ingredients are used up. Fold diagonally and crimp pastries closed with a fork. Transfer carefully to two baking sheets. Bake at 400 for 15 minutes, until pastries are golden brown and crispy. Allow to cool on baking sheet five minutes before serving with Spicy Cranberries. On Black Friday, grab your credit card and head to the Grind House Cafe and Juice Bar at 2431 Saint Paul Street, Baltimore, MD 21218 for a very special event. Eleven vegan artists have created new, original works of art to benefit Burleigh Manor Animal Sanctuary in Ellicott City, and help cover their substantial needs for winter funding. Basically – instead of hitting the mall for mass-manufactured plastic junk, you can choose to support local artists; a small, local, woman-owned business; and an animal sanctuary – in one stop. This is a win-win-win. Art items will make great holiday gifts, and Ayo & the Grind House crew are creating a VERY special night featuring herbal infused organic vodka & fresh juice cocktails, with an all-vegan small bites menu of ATL Finger Sandwiches, Garlik Kale Salad and Autumn-Quinoa Sushi – and Raw Chocolate Mousse with Berries. Tickets for this meal are $20 and a large portion of that goes to the Sanctuary. You can order this plate in Gluten-Free as well. Really this is an incredible deal – usually a cocktail like that alone is $12 to $15! Tickets are on sale now, and only ticket-holders get the special meal and cocktail. You can attend for free without the meal. 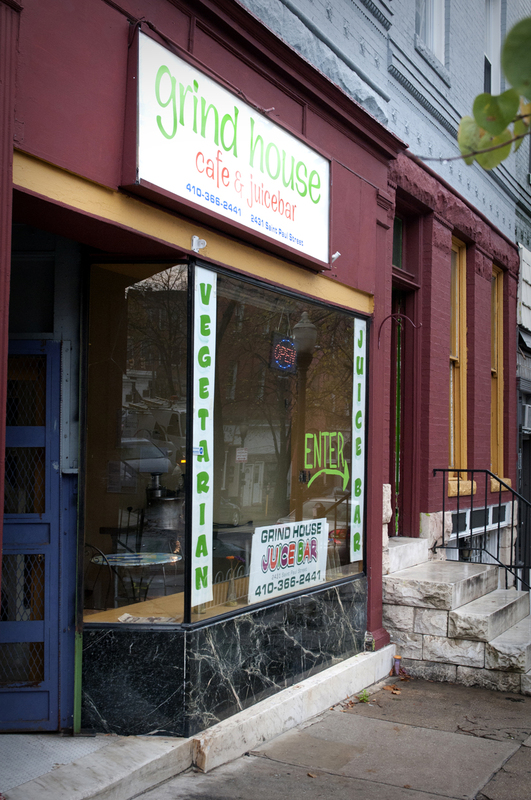 Usual favorites from Grind House will be available – wraps, smoothies, juices, soup – BUT these purchase do not benefit the animals, they are just usual purchases. ONLY the ticketed event meal is a donation for the animals. 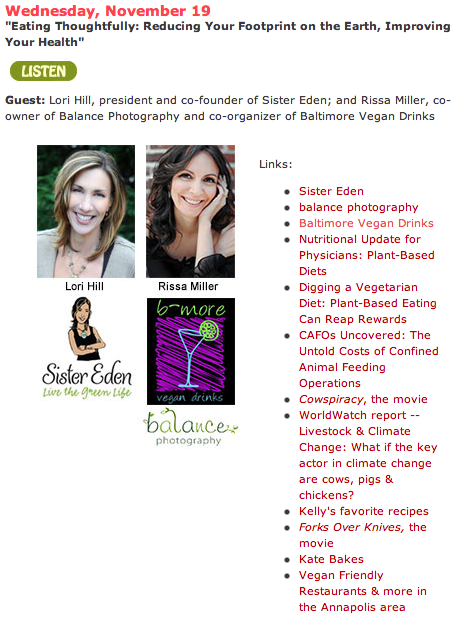 This event is co-sponsored by Baltimore Vegan Drinks, the Grind House Juice Bar, and Burleigh Manor Animal Sanctuary. Organic, herb-infused vodkas provided by The Wine Bin. The event is on Friday November 28th from 6pm to 9pm. Tickets for the special meal are $20; event is free to attend without a ticket and other food is available. But really, why would you skip that chocolate mousse?? DUH! 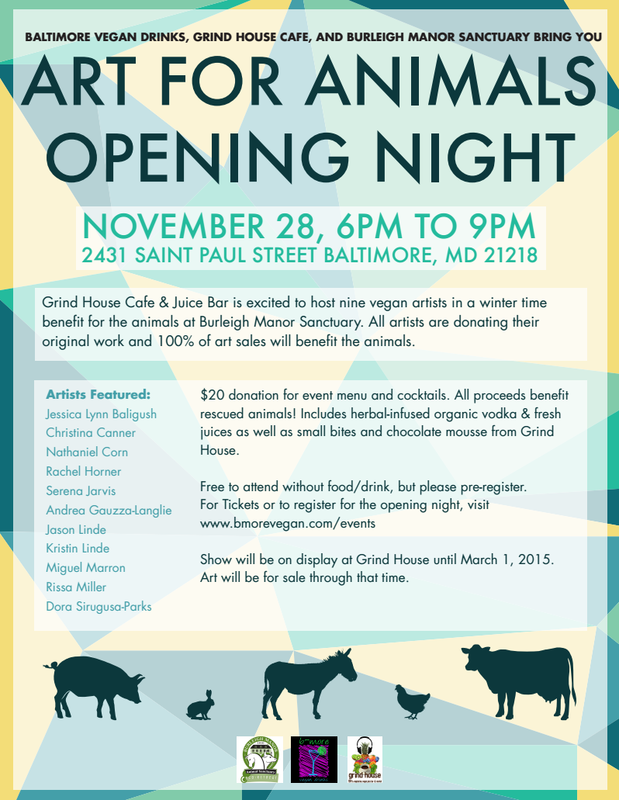 So come get arty and enjoy a special show created by vegans to benefit the animals! If you haven’t yet seen the wonderful new space at the Grind House, you are in for a TREAT! We both have new artwork in the show – hope to see you there – and bring a friend! 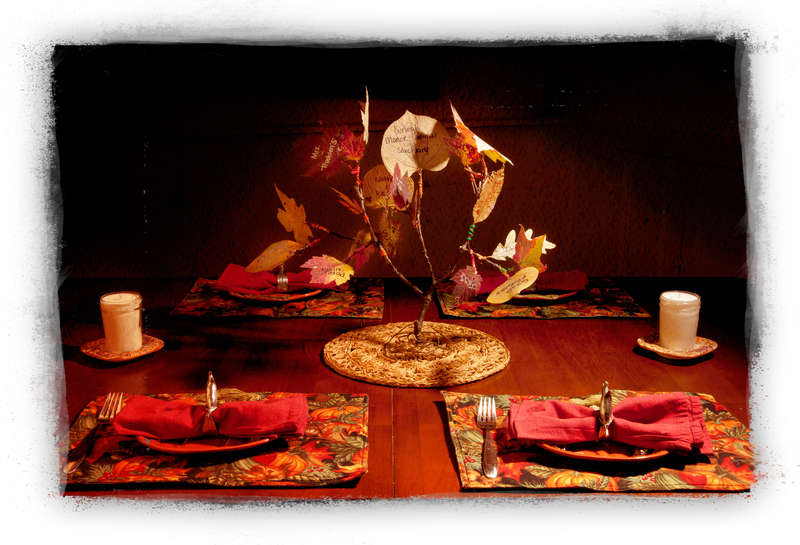 You can make a centerpiece for your Thanksgiving table – using free leaves, a stick, a wire coat hanger and twisty ties. For real. All you need is a little imagination, and these simple materials become a gorgeous Gratitude Tree: a reminder of all that your family is grateful for as you dine together on November 27th. The directions for this easy project are cross-posted over at the Sister Eden blog. It’s super for kids, grown-ups, couples and grandparents in families of all shapes and sizes. Everyone can collect and press leaves. Everyone can add what they’re grateful for. There are only a few technical parts – like pressing leaves and making the base. Click over to the Sister Eden post and get the instructions and get started today! 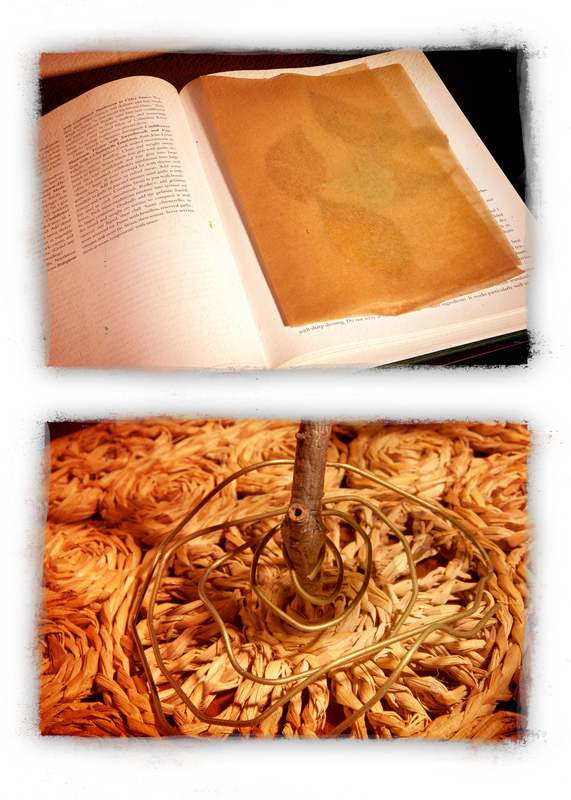 You’ll need to collect pretty leaves first, and dry them in a heavy book. The real fun begins when you start writing what you’re grateful for. You may get going and find you run out of leaves! Which is a wonderful problem, to have so many good things you’re thankful for! Yes, it’s okay. You can show off to your non-vegan friends with this recipe. It’s creamy, it’s decadent. It’s entirely plant-based and easily gluten-free. And did we mention – it’s also freaking delicious? 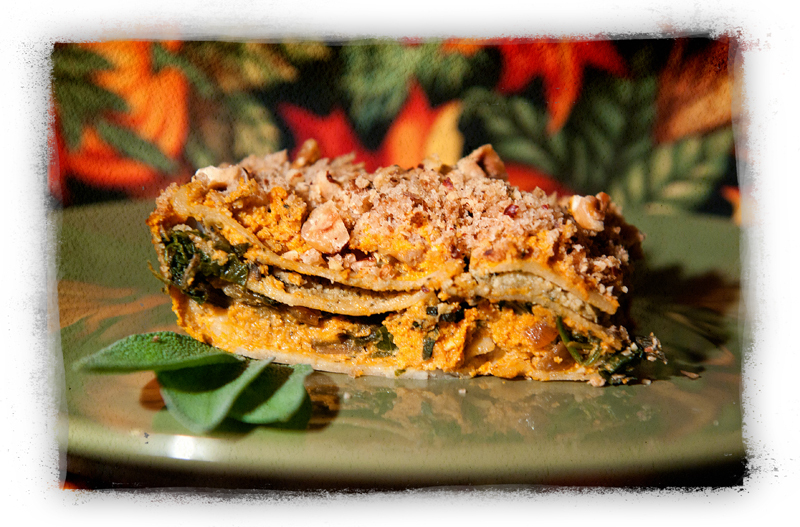 Our Creamy Butternut Squash Lasagna relies on cashews, lemon zest, sage and fresh greens for its pop. The hazelnuts on top, mixed with bread crumbs add to the richness and sophistication. This dish is not super fast, as you need to make two batches of “cream” in the food processor or blender, as well as cooking the noodles, but, we assure you – it’s perfect for a holiday table and will be a big hit with friends, family and colleagues. Before beginning the recipe, it is crucial to have the cashews soaked, and butternut squash cubed and cooked. Be sure to do both of these things in advance of making the lasagna. Start by draining the cashews and dividing them. You need 2/3 of the soaked cashews for the squash cream filling and 1/3 for the basil cream filling. Set aside the third of the cashews for the basil cream. In a food processor or high speed blender, add 2/3 of the cashews and process until mostly broken down but not to the point you have cashew butter. Add the cooked butternut squash, dried sage, dried thyme, nutmeg, cayenne, white pepper and salt. Process until all ingredients are incorporated and smooth. When done, set aside; the squash cream will be two layers of the lasagna. Rinse out the food processor or blender bowl and add the remaining third of the soaked cashews, as well as the fresh basil and lemon zest. Process until ingredients make a smooth green cream. This layer smells wonderful! Set aside until ready to assemble lasagna. At this point, place lasagna noodles into a pot of boiling water. Different varieties cook for different lengths of time, so read the box. Be sure to slightly undercook by 1 or 2 minutes, as the noodles will cook more in the oven. Next, make the greens layer while your noodles cook. In a large pan over medium heat, sauté the minced onion and garlic in olive oil for about 3 to 5 minutes, until soft and translucent. Add chopped Swiss chard and fresh parsley, cooking a few minutes until wilted. If using, add the splash of dry white wine and cook about 1 to 2 more minutes. Set aside off heat. To assemble the lasagna, first spray the casserole dish (we used 9×13) with nonstick spray or wipe it with olive oil. The first layer will be 3 lasagna noodles, placed next to each other. Top with 1/2 of the squash cream (spread evenly) and all of the chard/onion mixture. Add another layer of 3 noodles. Top with all of the basil cream, spreading evenly. Top with remaining 3 noodles. Smear last half of the squash cream across the entire surface of the lasagna. Sprinkle top with breadcrumbs and hazelnuts. Bake at 375 for 30 minutes, covered with foil. Uncover and bake an additional 15 minutes to crisp the topping. Serve warm. Sometimes there are moments of true joy in life. Simple, unadulterated joy. Such as finding out that several of the classic Girl Scout cookies are now available in VEGAN! Yes, you are seeing this correctly. Thin Mints, Peanut Butter Patties (aka Tag-a-longs), Lemonades and Thanks-A-Lots are vegan in some regions. We happen to have hit it big on this one, cause Maryland has the vegan cookies and our next door neighbor’s little girl is selling them. Woo-hoo! How does this work, you ask? It’s as simple as, well, cookies. 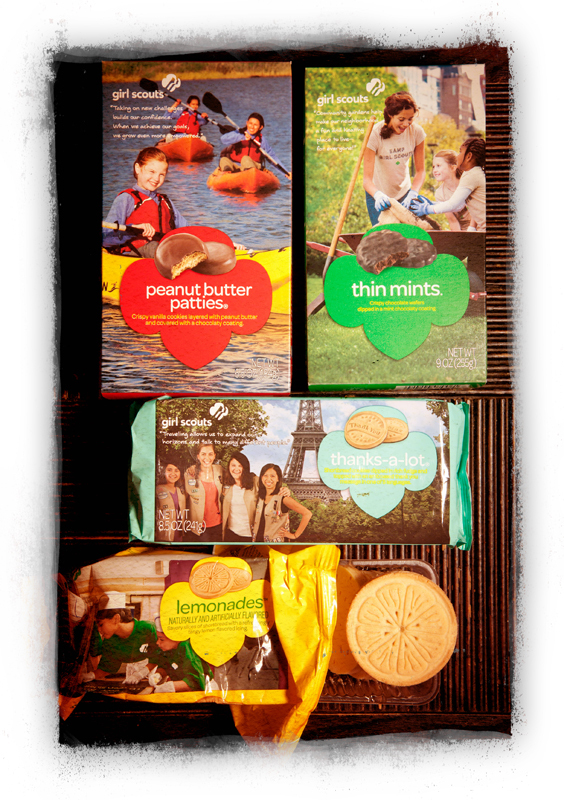 In the USA, there are two bakeries making Girl Scout cookies. ABC Bakery makes the vegan options. And it helpfully says “vegan” on the nutrition facts, so it’s easy to spot, in case your local Girl Scouts aren’t sure who did their baking. You can see what I mean on this label for Thin Mints. 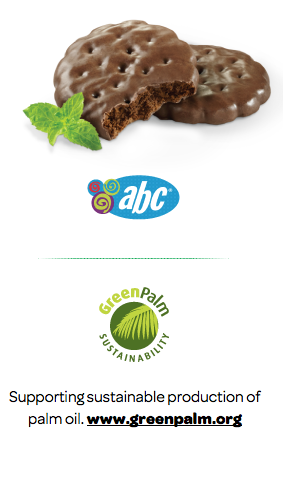 Notice also that the ABC Bakery is all about sustainable palm oil. A real plus! So, thank you, ABC Bakery and Girl Scouts of America! We have our supply in hand! OH – and you can also buy cookies to send to soldiers, as well. A nice way to say thank you. There are programs around the country for this, such as Operation Gratitude, Troop to Troops, and Operation Cookie. Your local scouting troop will know more about the program in your area!